Welcome to the ‘all new’ 2017 Kawasaki Versys-X 300 a new ‘adventure motorcycle’ for the commuter and learner category. 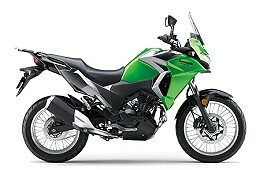 The ‘all new’ is in quotes because like it’s competitors specifically the Suzuki V-Strom 250 the Versys 300 is based on it’s regular road motorcycle in the 300cc class, the Ninja 300 and not the much bigger Versys 1000 or even the 650. As per the V-Strom 250 I think the use of the Versys brand is a marketing error as the regular Ninja 300 has more street cred than the Versys and it is only related vaguely to the other Versys in looks. Regardless of the it’s name the Versys-X 300 is another welcome addition to the class. In the past trail bikes where often used as learner motorcycles due to the tougher mechanicals but the Versys-X 300 is not, it is based on the Ninja 300 which is a tough little bike but in a different way. In terms of marketing I also find some of it degrading to the model like ‘lightening holes’ and ‘reinforced suspension’ give the impression of short cut design. Mind you this sort of ‘error’ is common in Kawasaki’s marketing. The new Versys-X 300 features a all new style from the other Versys models although we think the design is more inspired from the enduro class. regardless it does look good and well proportioned except for the skinny tyres. It will be a comfortable ride thanks to it’s long suspension travel and upright riding position and it’s Ninja 300 parts will mean it will be reliable. Like it’s competitors this sort of motorcycle will appeal to inner city couriers and riders. Out on the open road the lack a of a more powerful engine will be annoying especially if you’re carrying all your gear. Overall the Versys-X 300 is a good looking, decent small capacity motorcycle, at least showroom and spec wise since the major parts are from the Ninja 300 will mean it will attract learner and commuter riders who want a motorcycle that is not a sports style. I like it but wouldn’t buy a Versys-X 300 as it’s engine is on the slow side for easy freeway and country rides, I don’t do city rides. Sure it can do all that and more including the round the country trip but there are compromises as per it’s competitors.